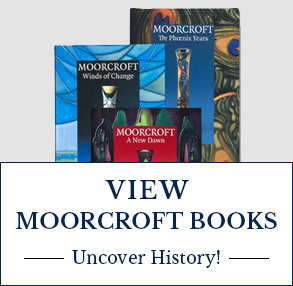 This page, together with the documents expressly referred to on it, tells you information about W Moorcroft Ltd (‘Moorcroft’) and the legal terms and conditions (‘Terms’) on which we sell any of our pottery and other items (‘Products’) listed on our website (‘our site’) to you. These Terms will apply to any contract between us for the sale of Products to you (Contract). Please read these Terms very carefully and make sure that you understand them, before ordering any Products from our site. Please note that by ordering any of our Products, you agree to be bound by these Terms and the other documents expressly referred to in them. You will be asked to confirm your acceptance of these Terms before being able to place an order. If you refuse to accept these Terms, you will not be able to order any Products from our site. You should print a copy of these Terms, or save them to your computer, for future reference. 1.1 Moorcroft operate the website www.moorcroft.com W Moorcroft Ltd is a company registered in England and Wales under company number 128500 and with our registered office at Sandbach Rd, Burslem, Stoke-on-Trent, ST6 2DQ which is also our main trading address. 2.1 The images of the Products on our site are for illustrative purposes only. Although we have made every effort to display the colours accurately, we cannot guarantee that your computer’s display of the colours accurately reflects the colour of the Products. Your Products may vary slightly from those images. Furthermore, all of our pottery is made entirely by hand which necessitates a multitude of slight variables in both colour, height, and raised ceramic design (created by a technique called ‘tubelining’). 2.2 Whilst we have made endeavoured to be as accurate as possible, all sizes, weights, capacities, design applications, dimensions and measurements slight variance may occur between pieces due to variance through the hand-making process/kiln firing of our pottery and other hand-made items on our site. 2.3 Periodically, our packaging and internal wrapping changes. Consequently, the packaging of the Products may vary from that shown on images on our site. 2.4 All Products shown on our site are subject to availability. We will inform you by email as soon as reasonably possible if the Product you have ordered is not available and we will not process your order. With kiln fired pottery there are sometimes inexplicable reasons that cause a particular flaw, which have not been seen before, and which result in the immediate discontinuation of that design immediately. In such circumstances, a full refund will be issued where payment has been taken. 2.5 All prices displayed on this website are in sterling. Unless indicated otherwise these are inclusive of VAT. 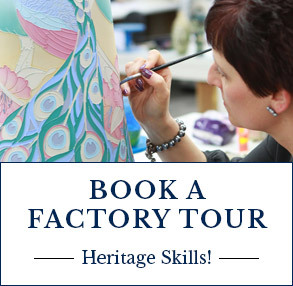 4.2 Factory Tours can only be booked for children over 11 years old. 5.1 As a consumer, you have legal rights in relation to Products that are faulty or not as described. Advice about your legal rights is available from your local Citizens’ Advice Bureau or Trading Standards Office. Nothing in these Terms will affect your statutory rights. 6.2 After you place an order, you will receive an email from us acknowledging that we have received your order. However, please note that this does not mean your order has been accepted. Our acceptance of your order will take place as described in clause 6.3 below. 6.3 We will confirm our acceptance to you by sending you an email that confirms that the Products have been dispatched (Dispatch Confirmation). The Contract between us will only be formed when we send you the Dispatch Confirmation. 6.4 If we are unable to supply you with a Product, for example because that Product is not in stock or no longer available, or because of an error in the price on our site as referred to in clause 8.4 below, we will inform you of this by email and we will not process your order. If you have already paid for the Products, we will refund you the full amount as soon as possible. 7.1 Whilst we anticipate that your order will be fulfilled by the estimated delivery date set out in the Dispatch Confirmation, due to the fact that each item is made by hand, it is foreseeable that there could be problems with the production of your ordered piece. For example, sometimes paint oxide mixes cause result in strong colour variances. Whilst, these occasions are rare, if your order cannot be fulfilled we will inform you and suggest alternatives delivery dates or offer you the option of a full refund. 7.2 Delivery will be completed when we deliver the Products to the address you gave us. 7.3 The Products will be your responsibility from the completion of delivery. 7.4 Postal charges for goods dispatched in the UK will be notified to you in the confirmation email. Deliveries outside the UK may be subject to IMPORT TAX and ADDITIONAL CHARGES for which you are solely responsible. 7.5 You own the Products once we have received payment in full, including all applicable delivery charges. 8.1 The prices of the Products will be as quoted on our site from time to time. We take all reasonable care to ensure that the prices of the Products are correct at the time of publication. However, if you discover an error in the prices of the Products you ordered, please see clause 11.5 below for what happens in this event. 8.3 The price of a Product does not include any applicable delivery charges. 8.4 Our site contains a large number of Products. It is always possible that, despite our reasonable efforts, some of the Products on our site may be incorrectly priced. If we discover an error in the price of the Products, we will inform you of this error and we will give you the option of continuing to purchase the Product at the correct price or cancelling your order. We will not process your order until we have your instructions. If we are unable to contact you using the contact details you provided during the order process, we will treat the order as cancelled and notify you in writing. Please note that if the pricing error is obvious and unmistakeable and could have reasonably been recognised by you as a mispricing, we do not have to provide the Products to you at the incorrect (lower) price. 9.1 Payment must be made by one of the following: Mastercard, Visa, Maestro, American Express or Paypal. Payment for the products and all applicable delivery charges is in advance. 10.1 If we fail to comply with these Terms, we are responsible for loss or damage you suffer that is a foreseeable result of our breach of these Terms or our negligence, but we are not responsible for any loss or damage that is not foreseeable. Loss or damage is foreseeable if it is an obvious consequence of our breach or if it was contemplated by you and us at the time we entered into the Contract. 10.2 We only supply the Products for domestic or private use. You agree not to use the Product for any commercial, business or resale purpose, and we have no liability to you for any loss of profit, loss of business, business interruption, or loss of business opportunity. 11.1 As part of our Legal obligations, Moorcroft is required to ensure that a complaints procedure is in place for all e-commerce transactions so as to provide you with a clear and transparent line of communication. Said to be the finest art pottery in the world today, Moorcroft take complaints about both the service you receive from us and our quality standards extremely seriously and the complaint procedure allows us to deal with them in confidence. Before each piece of Moorcroft is dispatched it has to pass through rigorous Quality Control tests. Those pieces of Moorcroft that do not reach our highest standards are sold separately. 11.2 If something goes wrong you should tell us. Complaints are recorded, along with any action taken. Indeed, Moorcroft value complaints and use information from them to assist us in improving our services in the future. Whilst our aim is to provide our customers and collectors world-wide with a reliable and efficient service at all times, sometimes things can go wrong. When this happens we would like to know, in order that we can put things right. Building strong and lasting relationships with all admirers of our art pottery is important to us, and we take the service we provide to you very seriously and will endeavour to deal with your complaint promptly. 11.3 When a problem arises in the first instance we ask that you send written details to our Retail Director herself, Kim Thompson. 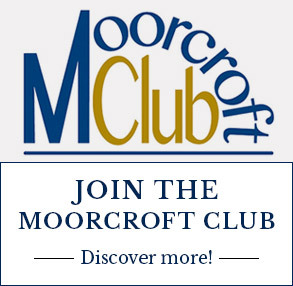 You can do this via telephone contact by calling +44 (0) 1782 820500 or via email to kim.thompson@moorcroft.com and she will discuss your complaint or dissatisfaction informally and endeavour to resolve it to your satisfaction. Telephone calls and emails will be responded to within 7 working days from her receipt of your complaint. If you contact Kim by letter @ W Moorcroft Ltd, Sandbach Rd, Burslem, Stoke-on-Trent, ST6 2DQ she will respond to your enquiry within a 14 day period. During periods of annual leave Kim will nominate a senior member of Moorcroft’s personnel to respond in her absence. If you are not entirely happy with Kim’s response you can appeal the decision/action that she has undertaken within 14 days of the said decision by contacting our Managing Director, Elise, Adams, in writing. Elise will respond to your complaint within 14 days of the receipt of your notification of the complaint. Whilst her decision in final, you are reminded of your overriding statutory rights and assistance offered through your local Trading Standards Office. 12.1 We have placed links on this website that we think you might wish to visit. We do not vet these websites and do not have any control over their contents. As such, we do not accept liability in respect of the use by you of linked websites. 13.1 Bespoke goods (‘Bespoke Goods’) any goods specifically personalised and/or tailored to your specification. These include, but are not limited to, any requested working (for which you have received email confirmation) fired into the base of your piece to mark an anniversary or special date. 13.2 Orders for Bespoke Goods cannot be cancelled or changed. 13.3 Bespoke Goods which are delivered as described and are in good condition may not be refunded. This clause does not limit your statutory rights. 13.4 Moorcroft is not responsible for customer generated mistakes, errors or defects, including spelling, typographical or grammar errors. To prevent these errors from happening, please review your order carefully, and/or any emails /letters you send to use in relation to such orders before submitting. 13.5 Faulty goods will be rectified free of charge. If you have any problems with your bespoke order you must report this to Moorcroft within 7 days of receipt. Please email enquiries@moorcroft.com with regards to any fault problem. 14.1 When we refer in these Terms to “in writing”, this will include email. 14.2 To cancel a Contract in accordance with your legal right to do so as set out Returns Policy or otherwise, please contact us in writing to tell us by sending an email to enquiries@moorcroft.com or by sending a letter to us headed ‘MY WISH TO CANCEL’ at W Moorcroft Ltd, Sandbach Rd, Stoke-on-Trent. You may wish to keep a copy of your cancellation notification for your own records. Your cancellation is effective from the date you sent us the email or posted the letter to us. 14.3 If you wish to contact us in writing for any other reason, you can send this to us by email or by pre-paid post to the above address. You also contact us using our Customer Services telephone line +44 (0) 1782 820500. 14.4 If we have to contact you or give you notice in writing, we will do so by email or by pre-paid post to the address you provide to us in your order. 15.1 All items purchased on the Moorcroft website under a distance contract (online or by phone) can be returned in accordance with your rights under the Consumer Contracts (information Cancellation and Additional Charges) Regulations 2013 (CCRs). 15.2 You can cancel your purchase and return the item if you inform us within 14 days from the date of delivery of goods. You will be responsible for the cost of returning the item to us unless the goods are damaged upon receipt. Items must be returned in their original packaging. Until the collection has taken place or the item has been returned to us, you will be required to keep the item in the same condition as it was in when delivered to you. We reserve the right to consider the condition of any item you return to us and make deductions to the refund paid to you on account of any use of the item or any damage to the product or packaging. 15.3 Your refund will be processed immediately upon receipt of the item back at premises. 15.4 Except as set out above, we do not offer refunds. Subject to the pottery being returned to us in person within 14 days we do offer exchanges, provided always that the pottery is returned in its original packaging and in the same condition in which it was received. 15.5 However, the above requirements are subject to, and do not affect, your statutory rights, including in respect of faulty items. 16.1 We may transfer our rights and obligations under a Contract to another organisation, but this will not affect your rights or our obligations under these Terms. 16.3 This contract is between you and us. No other person shall have any rights to enforce any of its terms. 16.6 These Terms are governed by English law. This means a Contract for the purchase of Products through our site and any dispute or claim arising out of or in connection with it will be governed by English law. You and we both agree to that the courts of England and Wales will have non-exclusive jurisdiction. However, if you are a resident of Northern Ireland you may also bring proceedings in Northern Ireland, and if you are a resident of Scotland, you may also bring proceedings in Scotland.